But had some weird issues with the power. Used my handy bat / alt voltage testor. battery is now at 12 - 5v of power almost dead. Now I gotta pull the alternator get it tested, recharge the battery. no it's defiantly not new. So tomorrow, going to hook up the alt, and all the crap back together and start going 1 by 1 with all the fuses, then vaccum hoses, then wiring. Something weird is going on and tracking this down is being a real pita. AC just got deleted mainly because it froze up. trying to adjust the idle, the idle is at 2k now at start and too much butter fly play. Adjusted the cable as much as I can but still not long enough for the idle to be right. http://www.youtube.com/watch?v=98EaCEJ4vu4 Video :-) start up taking from my HTC EVo 4g kinda muffled tho. Drove it around the block today, I'd insure it today and drive it to work but due to the crappy tires on it, I need to get a new set of tires before doing so. So Monday will be the full conversion day, Going to get smogged, new tires, then register it. sell the bird asap. Strong electrical burning smell coming around the ALT. Will be checking out the ALT later on today, make sure the ground cables are connected, and will be disconnecting the power to the A/C COndensor to make sure it's not that burning up inside. Yeah, I need to zip tie that down also. didn't look like it moved much from it's location, but it might of bounced around. Yep fixed that, also fixed my tail lights and dash lighting issue too. I will also mention the pink wire actually was laced with 3 other pink wires coming out of it before I crimped this. I have no idea what this guy was running but if it's anything with his previous wiring job... what a morooooon. Next is when I get back from Oregon is to order a new ignition cyl lock, I have to apply pressure to the key for it to run correctly. Driver Seat had 1 small rip in the side, but hey. Alot better then the other ones. This is what is broken. You can see where the metal broke. Ok got my CM Springs in, ordered 280zx Tokico HD shocks up front and z31 Tokico HD for the rear. Not going to be the best, but it's better then what it currently has. 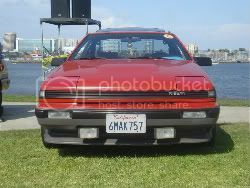 This weekend, I'm also going to pull out the SE body kit and see if I can readjust the front and rear bumper and re-attach the SE sides and lip. Oh yeah, another thing on my todo list... might as well do that tomorrow too. ready for the suspension upgrade!